With less than two weeks until school starts in Seattle, how likely are contract negotiations over educator pay to devolve into a teacher walkout? 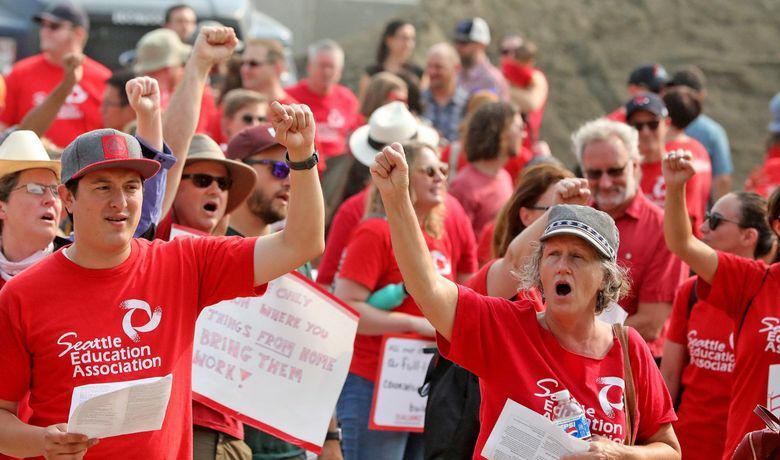 You’ve probably seen them on TV news and heard them on public radio: Teachers decked out in red at rallies across the state, decrying their pay and warning that they might go on strike. The prospect may alarm parents, worried about a disruption this close to the start of the school year. Imagine a first day of school with no teachers — which would mean kids losing instruction, families scrambling for alternative plans or parents losing pay to a day of unplanned child care. Maybe you’re wondering what’s at the heart of the dispute between some teachers and their school districts — and how likely contract negotiations in Seattle are to devolve into a teacher walkout before new Superintendent Denise Juneau’s first day of school. Why are teachers across Washington threatening to strike? In a final bid to settle the landmark McCleary school-funding case, state lawmakers this year funneled nearly $1 billion into local school-district coffers to pay for teacher salaries. That infusion of cash satisfied the Washington Supreme Court’s order that the state find a way to provide the money before the start of the 2018-19 school year. But it also reopened teacher contracts in virtually all 295 school districts in Washington — and there’s confusion over just how much money districts can spend on teacher raises. Some districts, including Bellevue, Edmonds and Lake Washington, already reached deals with their teachers unions to provide double-digit pay hikes this fall. Other districts, like Seattle, only recently started talks on teacher salaries. What do we know about the situation in Seattle, where classes resume in less than two weeks? A lot remains on the bargaining table between Seattle Public Schools and its teachers union, the Seattle Education Association. Negotiators are currently debating teacher compensation, race and equity issues such as making sure all schools have ethnic-studies classes, expanding mentorship opportunities and professional training, the district said in a statement. However, beyond stating that “important and complex conversations” would “continue at least through the week,” it did not provide a timeline for resolution. The union has scheduled a general membership meeting for Aug. 28, though union bylaws require members have at least 72 hours to review a tentative agreement before officially voting on it. How likely is the district to reach a deal with Seattle’s teachers union? The district has reserved a one-time $45 million surplus to pay for raises over the next three years. But as of Wednesday, neither side has presented a formal compensation package, said union President Phyllis Campano. While both sides agree that state lawmakers did not go far enough to fully fund K-12 schools in their latest budget, Campano said the district still has enough money for competitive wages. The union also is trying to bargain health benefits for substitute teachers, ways to increase the number of black teachers and boosting training on restorative justice. If a tentative agreement is not reached by this weekend, Campano said the general membership on Tuesday can vote on an action plan that could include a walkout. I read about teachers marching in other states in the “Red for Ed” movement. Are these actions related? Earlier this year, educators in largely Republican states protested at their legislatures, demanding better funding for teacher salaries and K-12 schools in general. Their action resulted in big boosts for teacher pay in Arizona, Oklahoma and West Virginia. But in Washington, the skirmishes between local districts and their unions haven’t targeted state lawmakers — for now. Still, a group of teachers from West Virginia sent their support for Seattle teachers in a letter read at last week’s rally. Are parents supportive of teacher strikes? Yes, according to recent polls. In April, during the height of teacher strikes in other states, The Associated Press-NORC Center for Public Affairs Research found 52 percent of Americans approved of educators leaving the classroom to strike for higher pay. A quarter of respondents to the AP-NORC survey disapproved. Earlier this month, the Washington Education Association, the powerful state teachers union, released the results of a poll that showed 58 percent of voters “somewhat” or “strongly” approve of teachers in Washington state striking for better pay. A quarter of respondents strongly disapproved. Has this happened here before? Yes. Three years ago, Seattle’s teachers staged a five-day walkout during the last round of contract talks. It was the first districtwide protest in 30 years and garnered national headlines. 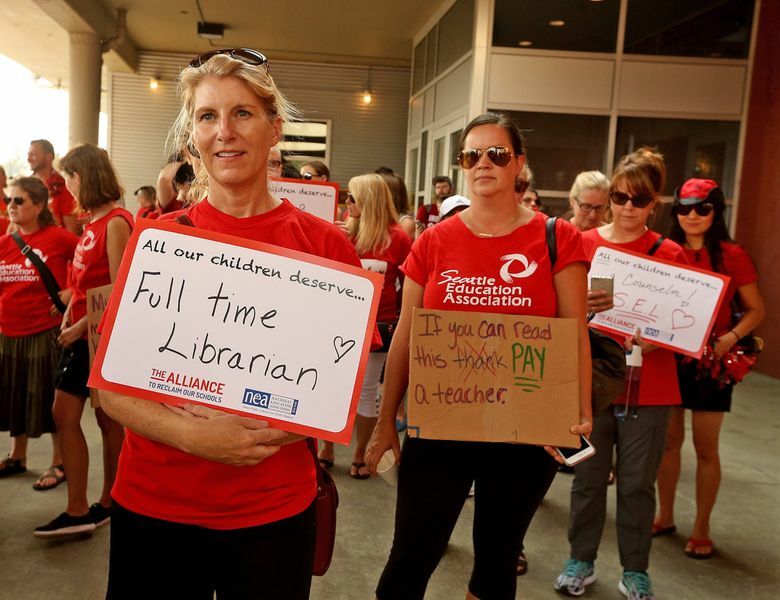 Similar to this year, the district and union couldn’t see eye-to-eye on salaries, prompting a strike that delayed the start of school for a week. The union voted to suspend the walkout after an all-night round of talks over teacher pay yielded a tentative contract. What was the long-term impact? That brings us to the end of this month, when the contract born from the last strike expires. It gave teachers a 9.5 percent raise over the course of three years — on top of cost-of-living wages. The union also negotiated a half day of training on making discipline fairer, the removal of student test scores from teacher evaluations and the creation of school-based racial-equity teams. Are teacher strikes even legal in Washington? Statutes governing K-12 teachers are pretty much silent on whether they can strike, according to Lea Vaughn, a labor-law expert and professor at the University of Washington’s School of Law. In 2015, the Seattle School Board authorized the superintendent to seek legal action to force teachers and other school employees back to work. But a union might view such a tactic as adversarial, Vaughn said, meaning a superintendent as new as Juneau may want to consider long-term repercussions before turning to the courts. How is the district preparing for a potential strike this time around? After the 2015 strikes, the district and union agreed to bargain their new contract in a different way. Rather than both sides presenting their preferred package and making changes back-and-forth, teams of negotiators have met for months to find agreement on individual issues. 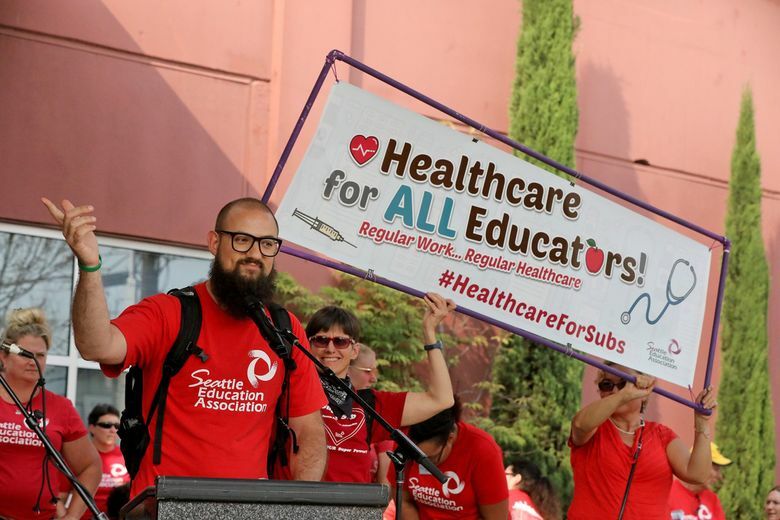 “This means that the district and (Seattle Education Association) both bring important issues to the table and work to find common ground,” the district said in its statement.